SECOR (Sequential Collation of Range), EGRS (Electronic & Geodetic Ranging Satellite) were small geodetic spacecraft used to precisely determine points on the earth. Geodetic SECOR (Sequential Collation of Range) was an all-weather geodetic survey system which was in operational use for several years, establishing a global survey network. It used the successive positions of artificial satellites in space to determine locations on the earth's surface with exactness over long distances. The system consisted of a satellite and four ground stations. Three at geographical points where the co-ordinates had been surveyed accurately and the fourth at an unknown location. Radio waves were flashed from the ground stations to the satellite and returned. The position of the satellite at any time was fixed by the measured ranges from the three known stations. Using these precisely established satellite positions as a base, ranges from the satellite to the unknown station were used to compute the position of the unknown station. Geodetic SECOR allows continents and islands to be brought within the same geodetic global grid. Each ground station was entirely portable and contained three units: a radio frequency shelter, a data handling shelter and a storage shelter. Lighter weight, solid-state equipment was developed to replace the initial units. The satellite had a mass of 18 kg and contained a transponder, a telemetry system to monitor temperature and operating voltages, and a power unit comprised of solar panels and batteries. There were two types of SECOR satellites: the spherical Type I SECOR and the cubic Type II SECOR version. The size of the Type II SECOR satellite was much more compact measuring 25.2 × 29.8 × 34.9 cm and weighing approximately 17.6 kg. The satellite was almost covered with solar cells on all surfaces. The number of antennas was the same as for the Type I, but, rather than being "collapsible," they were made of flexible steel tape. The prime reason for inception of the Type II was to provide a satellite which was extremely adaptable as a secondary payload. Launch vehicles that were funded by primary payloads frequently had additional space available for secondary payloads of low weight and suitable compactness. Since the Type II met these requirements, the Army avoided the high costs of launch vehicles. The satellite also provided flexibility in accepting transponders of several different designs. Because the Type II's construction was compact and ruggedized, it was easier to handle. Better provisions were made for external evaluation of the satellite's performance during acceptance and pre-launch test phases. Covers and panels did not have to be removed; therefore, monitoring the internal parameters of the system was more realistic. 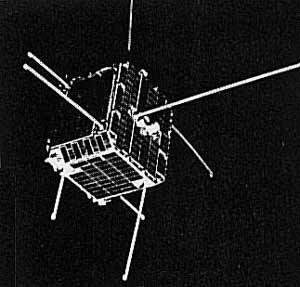 The Type II satellite was constructed primarily of aluminum and was assembled around four structural subassemblies: baseplate assembly, center support assembly, solar panel support assembly, and wraparound assembly. The baseplate assembly provided mounting surfaces for the transponder and the center support and solar panel support assemblies. The center support assembly provided compartments for the storage of batteries as well as mounting surfaces for the telemetry and power system components. This assembly also supported the telemetry antenna. The solar panel support assembly provided surfaces to support the strings of solar cells. The wrap around assembly supported the solar panel assembly and the transponder ranging antennas.